Not only did the U.S. break the record for warmest May, but National Climatic Data Center (NCDC) preliminary data, released late this morning, show that the entire Northern Hemisphere land and ocean surface temperature and the global land temperature were also the warmest on record. The combined global land and ocean temperature was the second warmest on record, behind 2010. 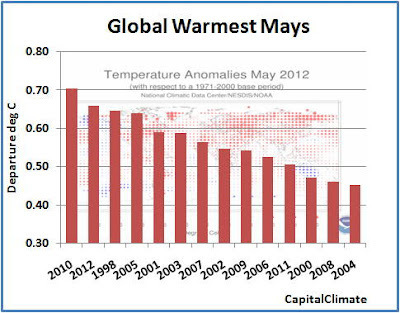 All continents, except Australia, averaged warmer than the climatological base period of 1971-2000. 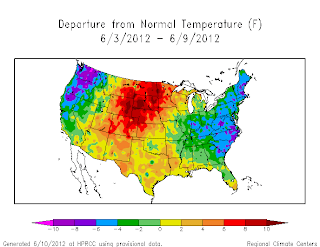 National Climatic Data Center (NCDC) preliminary regional data confirm that the U.S. has completed its 26th consecutive week of warmer than normal temperatures on June 9. This marks 6 full months of continuously warm average temperatures. 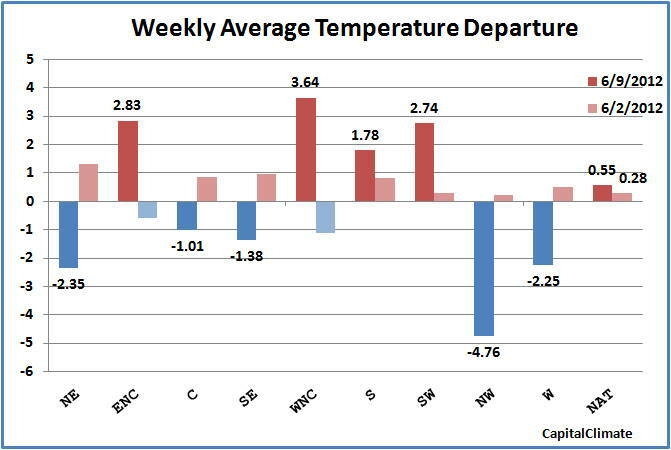 The geographically adjusted national average (NAT) was 0.55°F above the climatological normal, up from 0.28°F the previous week. 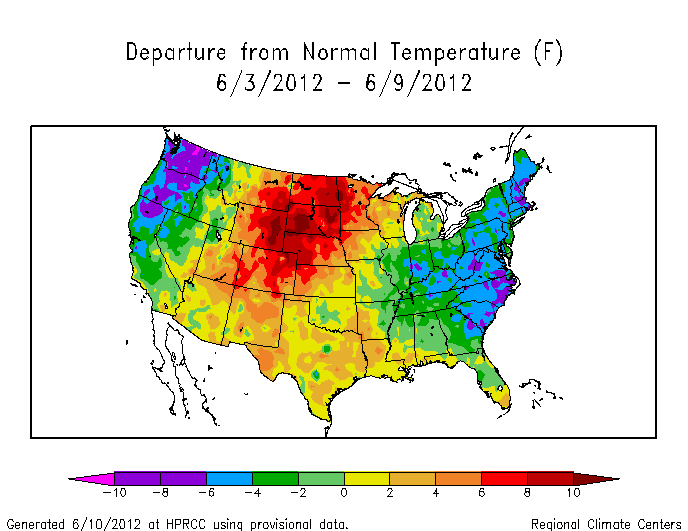 Of the 9 climate regions, 5 were below normal: Northeast (NE), Central (C), Southeast (SE), Northwest (NW), and West (W). 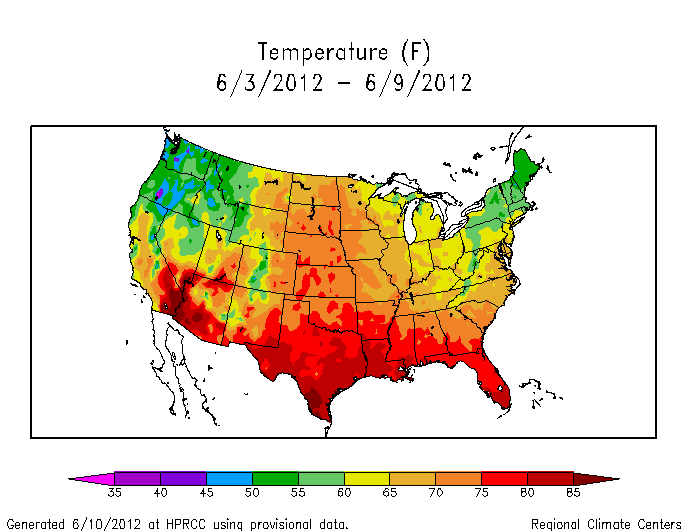 The other 4 were above normal: East North Central (ENC), West North Central (WNC), South (S), and Southwest (SW). The coolest region relative to average was the Northwest (-4.8°F), and the warmest was the West North Central (+3.6°F). 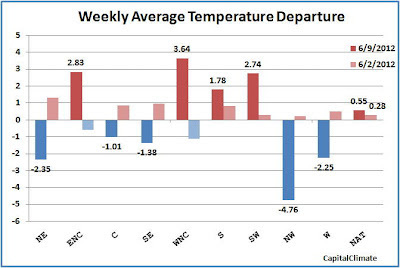 As shown on the chart, each region reversed between warm and cool in the past 2 weeks, except for the South and Southwest, which remained warm. A RECORD HIGH TEMPERATURE OF 107 DEGREES WAS SET AT DEL RIO TODAY. THIS BREAKS THE OLD RECORD OF 103 SET IN 1996. ALSO OCCURRED IN 1917 AND 1906. A RECORD HIGH TEMPERATURE OF 101 DEGREES WAS SET AT HARLINGEN TODAY. THIS TIES THE OLD RECORD OF 101 SET IN 1942. TODAY. THIS BREAKS THE OLD RECORD OF 98 SET IN 2001. THE TEMPERATURE IN AMARILLO REACHED 100 DEGREES AS OF 218 PM TODAY. THIS TIES THE OLD RECORD WHICH OCCURRED IN 1917 AND 1964. TODAY. THIS BREAKS THE OLD RECORD OF 106 SET IN 1958. HIGH TEMPERATURE. THE PREVIOUS RECORD OF 104 DEGREES WAS SET IN 1958. TEMPERATURE. THE PREVIOUS RECORD WAS SET IN 1958. A RECORD HIGH TEMPERATURE OF 105 DEGREES WAS SET AT MIDLAND TODAY. THIS BREAKS THE OLD RECORD OF 103 SET IN 2011. 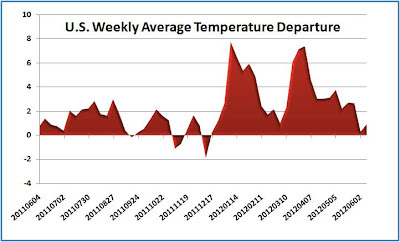 After dipping to within 0.3° of average last week, preliminary National Weather Service (NWS) data indicate that the week of June 3-9 (ending yesterday) was the 26th consecutive week that U.S. temperatures have been warmer than average. 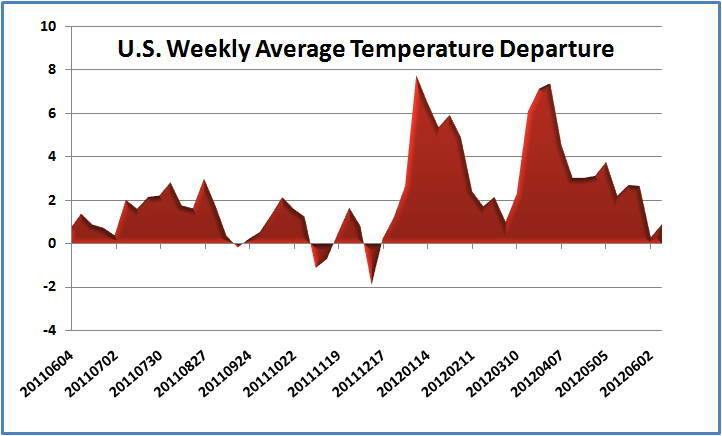 The average temperature for 214 NWS stations was 0.9° above the 1981-2010 climatology. Temperatures were mostly below average on both coasts, particularly in the Pacific Northwest, but generally warm conditions from the Mississippi Valley westward through the Rockies were enough to bring up the average. The warmest individual location was Denver, Colorado (CO-DEN) at +12°, and the coolest was Pendleton, Oregon (OR-PDT) at -9°. 5 PM CDT Update: Rainfall has gradually tapered off this afternoon at Pensacola, but the daily total is up to 1.92". 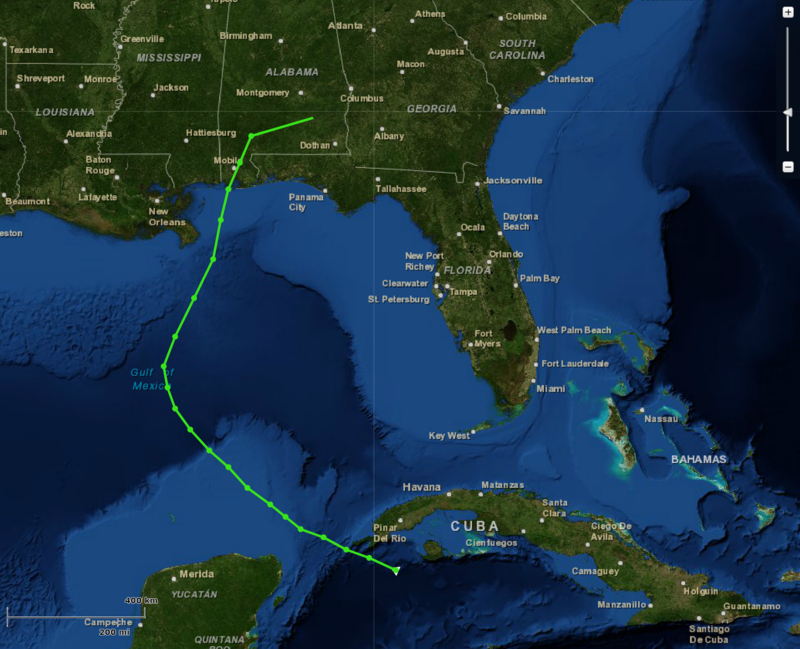 Excessive rainfall from a nearly stationary non-tropical storm crushed the daily precipitation record at Pensacola, Florida on June 9 (Saturday). The 13.13" of rain drowned the old record of 1.95" set in 1913 by a factor of 6.7 to 1. It was also the second highest all-time daily rainfall amount, exceeded only by the 15.29" from a tropical storm on October 5, 1934. The previous all-time June daily record was 10.10" on the 29th in 1887. Over 1" fell in each of 5 consecutive hours and in 7 out of 8 consecutive hours. The largest amount was 3.17" (over 1" more than the previous daily record) in the hour ending at noon. An additional 1.51" of rain had already been recorded by 1 pm CDT today. The record for June 10 is 2.81" in 1968. Pensacola climate records began in 1879. The 5.79" at Mobile, Alabama also smashed the June 9 record, which was 1.39" in 1968.